It was like someone had flipped a switch. 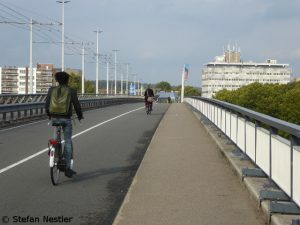 As soon as I had crossed the German-Dutch border behind Emmerich on the right side of the Rhine, I felt like I was in a different bicycle world. It all started with the fact that many more people were cycling. Seniors with e-bikes, housewives, with their market purchases on the luggage carrier, opposing the wind, large groups of bycyle racers, parents and their children, all with bikes. After my departure in the morning in Rheinberg-Ossenberg north of Duisburg, I had hardly met any cyclists on the bike paths on the dykes. This time the weather was not an excuse. It was misty until noon, but dry. And the wind blew only moderately.